A coming of age drama with some humour, Diner navigates the crevasse between youth and adulthood through the story of six men grappling with growing up. It's Christmas time in Baltimore, 1959. 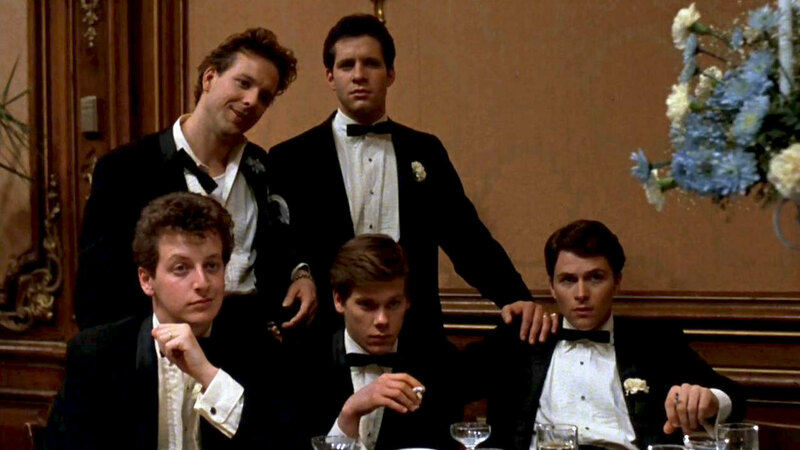 As both the year and decade draw to a close, a group of college friends converge in preparation for the upcoming wedding of sports trivia fan Eddie (Steve Guttenberg). 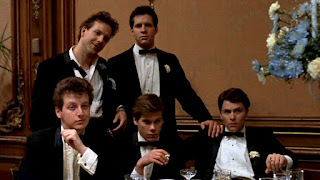 His five buddies include the already married music trivia addict Shrevie (Daniel Stern), the rich, aimless and frequently drunk Fen (Kevin Bacon), charismatic gambling addict Boogie (Mickey Rourke), New York-based Billy (Tim Daly) and circumspect Modell (Paul Reiser). The local Fells Point Diner is their favourite hangout and meeting point. Eddie is planning to subject his fiancée to a sports trivia test before finalizing the wedding. Shrevie and his bride Beth (Ellen Barkin) are already running into trouble in their young marriage. Boogie is in debt trouble and encourages bets on his dating exploits to raise cash. Billy has trouble defining his relationship with his close friend and television producer Barbara (Kathryn Dowling). And Fen is living a carefree prankster life, refusing to grow up. With no traditional narrative structure and plenty of improvisation, first-time director Barry Levinson crafts a fine spiritual successor to American Graffiti. Diner features a brilliant cast full of pre-stardom talent, and a fluid tone allowing the men to reveal their stories through natural conversations punctuated by often misguided adventurism. The film is set in Levinson's home town, and inspired by his own experiences. The common theme is the struggle for emotional growth, as the men confront the collective challenge of transitioning from what mattered in their youth to embracing the responsibilities of being men. Eddie is hiding insecurities behind the pointless test he is imposing on bride-to-be (and never properly seen) Elyse, and will face his own test on what matters. Shrevie is childishly upset at Beth because she does not understand or appreciate his useless talent for knowing the song, label and colour of every hit single's B-side. She turns to Boogie for comfort, triggering another test of responsibility. Boogie himself is busy pretending to be a law student to attract the ladies while accumulating debt, and before the new decade dawns will need to confront the consequences. Billy is close to Barbara, a woman embracing her career. Circumstances force them to contemplate the future, and the relatively simpler answers of the 1950s won't work anymore. Fen's life is wasting away in the arena of irresponsibility, and an encounter with his grounded brother reveals the breadth of separation possible between siblings. Modell is more of an observer and witness, pushing buttons as appropriate, but other than never directly asking for anything, his character is the least developed. Levinson's remarkable achievement is in convincingly portraying the cast members as friends. He encouraged the young men to hang out together before filming, avoided excessive rehearsals and stimulated improvisation. The result is an undeniable vibe of close friendship, and Diner glows with the warmth of men most at ease hanging out together. Mickey Rourke was third billed after Guttenberg and Stern, but exudes the undeniable star charisma that would soon catapult him into stardom. The other cast members are all steady, with Steve Guttenberg demonstrating sufficient promise to suggest he chose the wrong career path upon veering to mostly trivial comedies. 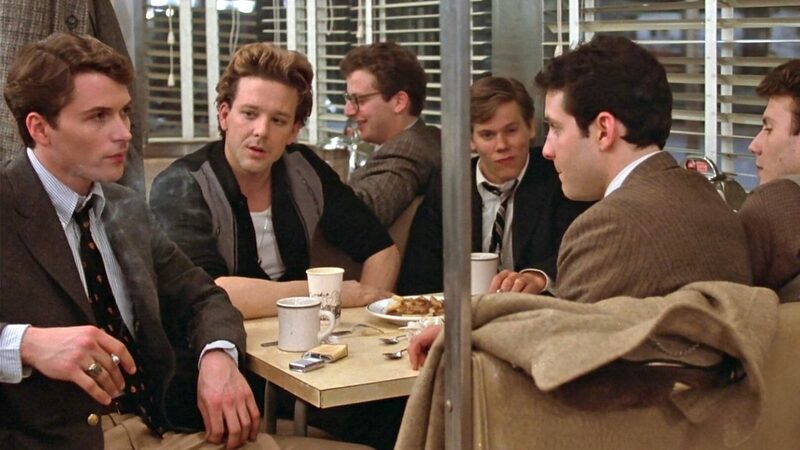 For the six friends Diner is simultaneously about not much and everything, the future hanging in the balance as young men confront short-term decisions carrying long-term implications.